Staci and I met in new employee orientation. She was about to start work as a marketing assistant for the magazine. I would be the newest advertising sales assistant, joining a team of twelve. In the beginning, I envied Staci–the other women (and they were all women) in my position were a few years older than me and I found their existing friendships intimidating. Staci and I were the low women on the totem pole, just weeks removed from college graduation. She might have been slightly less green than me, thanks to a few internships, but we were more or less the same: excited, excitable twenty-one year olds learning to live in Manhattan. I was usually the more rebellious one of our duo. The one more likely to show up at the office hungover and wearing a baseball cap, taking Casual Friday to the extreme. But it was Staci who figured out how to jerry-rig Lotus Notes to send email externally. She showed me the trick and while I was scared it would get me fired (!! ), I was super psyched to be emailing my college buddies again. Meanwhile I sent comp copies of the magazine to all of my friends without fear. Seriously, I’d send twenty or more copies out unsolicited each week. I thought I was a benevolent publishing guru in the making. And that the world needed to read our magazine. Staci and I often had lunch together. We quickly got sick of the massive company cafeteria with its many options and subsidized prices (because we were jerks) would sometimes leave the building and splurge on Pasta Lovers, which was extravagantly expensive to us back then, or Benihana or TGIFridays (now I’m horrified). Some weeks, we’d go to a subterranean coffee shop for Mocha Mondays when the drink was one dollar off. And sometimes we went for manicures at a dump of a nail salon on 49th Street. I used to bite my nails and hoped manicures would help me break the habit. Staci had lovely hands and I wanted mine to look more like hers. She was way more ladylike than me. 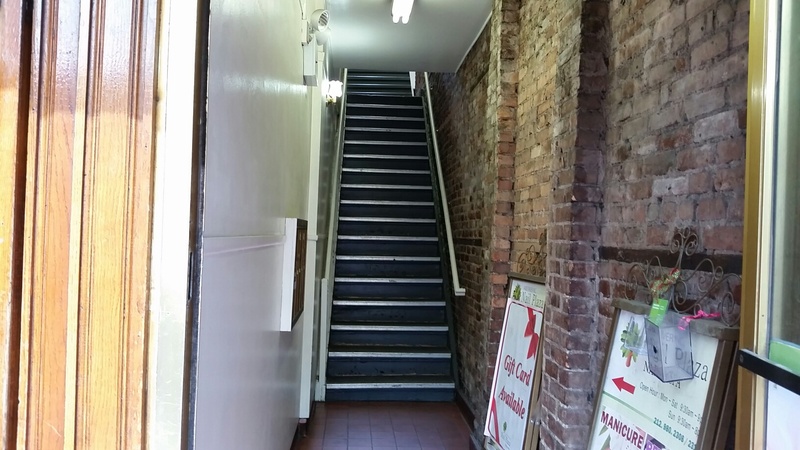 The salon was up a rickety set of stairs on the second floor of a dodgy old building. The staff was never especially friendly–it felt something like a nail version of the Soup Nazi. It made me anxious. Would we get back to the office in less than the hour allocated for lunch? Would the manicurist make tsk-tsk noises at my stubby fingers? Manicures were $6. But in spite of the setting and the price, it felt luxurious. We were indulging our 21-year-old selves. When I moved back to NYC in 2011, I thought about all of the cheap manicures I’d get. How much money I was about to save. Instead, I started going to a swanky nail place in my neighborhood. Times changed. I wish I could say I stopped going for cheap manicures for ethical reasons, but really I just enjoyed going to bright, clean salons with pleasant, seemingly-happy employees. And thank goodness I spoiled myself because think about it: isn’t a service that takes at least thirty minutes of hands on care worth more than $6? I know better now. If you don’t, please read this. Good work, Sarah Maslin Nir. This entry was posted in Chick stuff, Good intentions and tagged manicure, nails, New York Times, ny times, nyc, NYT on May 18, 2015 by onechicklette.